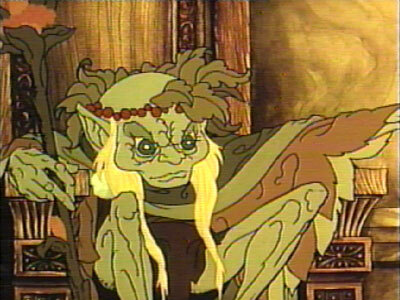 I tried to do a single post on the merits of animated Tolkien films, but it got away from me. Instead, to celebrate the release of the first new Hobbit movie on Friday, we are going to do a whole week of Tolkien posts. Participation is encouraged! If you feel inspired to do a Tolkien post this week, let me know and I will link to it here. You may also use my Tolkien Week banner, if you’d like. If you do, just be sure to link back here. And if Tolkien isn’t your thing, never fear—regular blog posts will resume next week. I find this film entirely charming. Go into it with the proper expectations (it is an ANIMATED CHILDREN’S MOVIE) and you will find a beautiful little film that hits at the heart of The Hobbit story. I confess I haven’t actually seen it for a number of years, but one of its most valuable and enchanting elements is the music, performed by folk singer Glenn Yarbrough. I found a youtube playlist of the entire soundtrack, which has only ever been released on LP. Go check it out! Listen to this track all the way through, and you will also encounter John Huston’s voice as Gandalf, reciting directly from the book the story of Smaug and the Lonely Mountain. I have no complaints about Ian McKellan’s Gandalf whatsoever, but the timbre of John Huston’s voice is so rich here, and so transporting. All in all, I think this old movie is an excellent adaptation of The Hobbit, and it shouldn’t be completely discounted just because there’s a shiny new film on the loose. Even the song lyrics that don’t come from the book at all, like those of The Greatest Adventure (Track 1), seem to capture the heart of the story; of what it is to be a small person who suddenly discovers he is capable of great things after all. The chances, the changes, are all yours to make.